Felicia travels all over Iowa and the Midwest performing and teaching her high-flying acts. She specializes in aerial silks, hammock, hoop (lyra), and partner acrobatics. From weddings, corporate events, and expos to VIP parties, concerts, and festivals; her gravity defying acts add a touch of glamour, fascination, and elegance to any event. She also offers ambient movement above crowds, aerial champagne services, and live art. Felicia can customize performances and costuming to fit your events theme or taste; from Circus to Cirque Du Soleil and everywhere in between. Felicia is Iowa's first and premier aerial arts coach. She takes great pride in building a safe and artistic aerial community in the central Iowa area. Anyone can try aerial arts; classes are forming all the time so follow Cirque Wonderland to keep up! Iowa Fly Girl Productions is a collective of many different entities that all carry the same goal; Be Inspired. 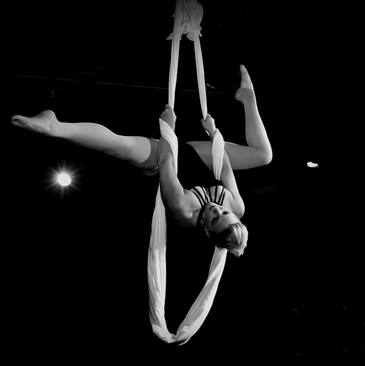 Felicia produces and directs dozens of events with the goals to give aspiring aerialists and performing artists an opportunity to perform and to give audiences a chance to see the big city entertainment the our little city has to offer.